The revelation that Donald Trump Jr. met for 20 minutes at Trump Tower with Russian lawyer Natalia Veselnitskaya in June 2016 has skyrocketed her to mainstream news media notoriety. Although she has been painted by Democrats as a Russian government official, numerous reports and photos show she has a long record of working with U.S. political figures, including many Democrats. For example, The Daily Caller News Foundation Investigative Group revealed on Wednesday that California Rep. Ron Dellums was a hired lobbyist for Veselnitskaya. According to a Washington Post story, she worked for years on a case with Glenn Simpson, the founder of Fusion GPS, a firm that produced a widely discredited dossier against Trump. She also worked with Christopher Cooper, the founder and CEO of Potomac Square Group, which has had Democratic clients including California Government Jerry Brown, Democratic presidential nominee Howard Dean, and Joe Trippi, according to the Daily Caller. And it was Obama’s Attorney General Loretta Lynch that granted her an extension in late 2015 to stay in the U.S. after her visa was due to expire, under “extraordinary circumstances” related to defending a case in New York, according to the Hill. She was granted an extension through January, but it’s not yet clear how she was able to be in the U.S. in June 2016, when she met with Trump Jr., and again January 2017. Four days after her meeting with Trump Jr. on June 9, 2016, she was in Washington, D.C. for a movie screening of an anti-Magnitsky Act film at the Newseum with at least five congressional staffers and State Department officials, according to the Hill. The next day she attended a House hearing, sitting in the front row behind Obama’s former U.S. 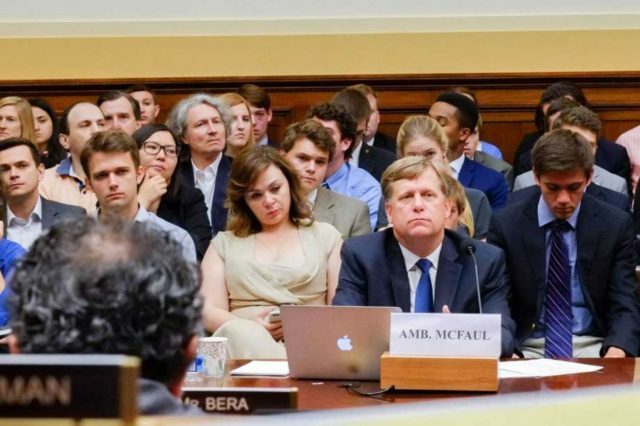 Ambassador to Russia Michael McFaul, who was testifying, according to photos of the hearing. McFaul has taken to Twitter to claim that Republicans placed her there, apparently next to his family members, and has denied any meetings with her. Around that time, Veselnitskaya also attended a dinner with the chairman of the House subcommittee overseeing Russia policy, Rep. Dana Rohrabacher (R-CA), and about 20 other guests, according to the Hill. Rohrabacher said he believed she and Dellums were there lobbying other lawmakers to reverse the Magnitsky Act. The Magnitsky Act, opposed by Russian President Vladimir Putin, imposes sanctions on Russia for alleged human rights violations connected to the death of a Russian lawyer, Sergei Magnitsky, who had claimed to uncover fraud by the Kremlin. Veselnitskaya appears to have been inside Sen. John McCain’s office in December 2015, according to a photo of a man and the Arizona Republican senator she uploaded to Facebook. While critics have accused her of being a high-level Russian agent trying to help the Trump administration, there is no indication she ever wanted to help the Trump campaign, and there are indications she actually opposed Trump’s election. Veselnitskaya appears to have attended an anti-Trump rally on January 21, according to pictures posted on her Facebook page. Protesters held signs saying “Impeach Trump” and portraying him as close to Russian President Vladimir Putin. Just three days before her meeting with Trump Jr., Veselnitskaya twice tweeted an article headlined “NY Attorney General: Trump University Is a Straight Up Fraud Case,” according to a Twitter account appearing to belong to her. Another time, she tweeted out a story on Clinton vowing to win the Democratic nomination despite losing a primary race to opponent Sen. Bernie Sanders (I-VT). And both she and Trump Jr. have said nothing came of the meeting. According to emails released by Trump Jr., he believed she would have incriminating information on Hillary Clinton. However, Veselnitskaya told NBC News this week that she was there as part of a lobbying campaign to reverse the Magnitsky Act. It was Rob Goldstone, whom the Trumps had known from the 2013 Miss Universe Pageant in Moscow, that suggested there was incriminating evidence through a client of his that was allegedly close to Putin. Legal scholars from across the political spectrum agree that Trump Jr. did not do anything illegal, even if the meeting looked bad on Trump Jr.’s part. As the narrative that Trump Jr. did something illegal is crumbling, Trump critics are now arguing that whether the meeting was illegal is less important than whether it was part of a larger attempt by the Russian government to recruit Trump Jr. or “dangle” the prospect of collusion. “It’s entirely possible that a Kremlin effort to help Trump beat Hillary Clinton reached to lower levels because that’s where it was easiest to establish contact with Trump’s family,” wrote Bloomberg columnist Leonid Bershidsky, who describes Veselnitskaya as an important figure only in the Moscow Region, outside of Moscow city itself. “But it’s more likely that Veselnitskaya, the tenacious and ambitious lawyer who could pull every string in the Moscow Region, did so to get her pet issue — the repeal of the Magnitsky Act, which was getting her major client in trouble — in front of some important Americans. That kind of effort would have been on the right level,” he said.